Frozen Summer Fun LIVE! at Disney’s Hollywood Studios will be ending on September 28th after being extended from its original early September closing date. The event which has proven to be extremely popular with guests, so Disney will be extending some parts of the event through the fall. Here is a summary of what is staying, and what is going. “For the First Time in Forever: A ‘Frozen’ Sing-Along Celebration” will be remaining, playing in the Premiere Theater on the Streets of America. The number of shows per day vary, up to a maximum of 10. There is some speculation that the show will ultimately move to the American Idol location, but this has not yet been confirmed. Wandering Oaken’s merchandise location and play area will move to the former American Film Institute Showcase, located at the exit of the Studio Backlot Tour. There will be no ice skating, but the real snow playground and Frozen merchandise will continue to be available. The Royal Procession mini-parade, the Frozen Fireworks show, and the Ice Skating will be coming to a close on September 28th. Along with the extension to Frozen at the Studios, also look for Frozen characters to appear at the Magic Kingdom for the holidays. 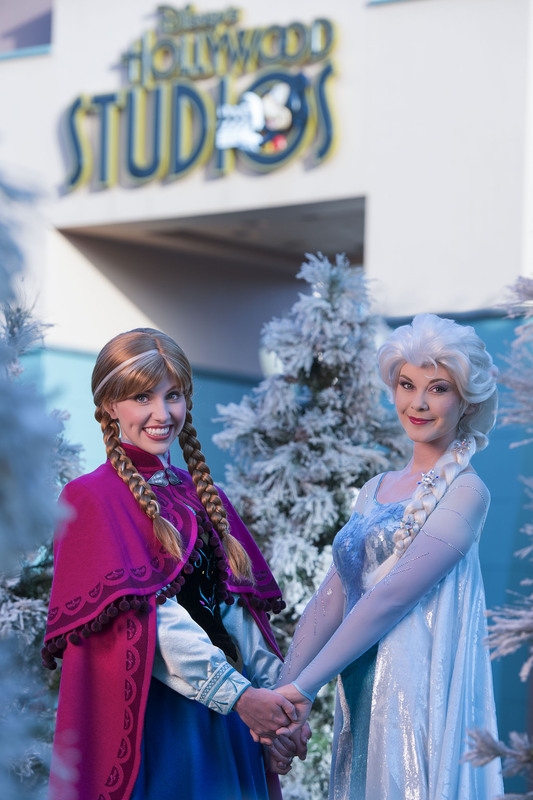 Anna and Elsa will be appearing in the Once Upon a Christmastime Parade and a new castle lighting ceremony which replaces Cinderella’s Holiday Wish.